SABINE PASS, Texas (CNN) -- With howling winds and driving rain, Hurricane Rita made landfall at 3:30 a.m. ET Saturday on the extreme southwest coast of Louisiana near Sabine Pass, Texas. The hurricane slammed the Gulf Coast as a Category 3 storm, with winds of 120 mph. Damage was reported in the pre-dawn hours along the region from Galveston, Texas, to Lake Charles, Louisiana. At 8 a.m. ET, Rita was downgraded to Category 2 on the Saffir-Simpson scale of hurricane strength, the National Hurricane Center said. It was centered between Jasper and Beaumont, Texas. Rita's sustained wind speed has reduced to 100 mph as it moves northwest at near 12 mph. NHC Director Max Mayfield said the storm could produce 10 to 15 inches of rain over the next day or two and it may stall and remain stationary. Concern remained Saturday about Rita's storm surge, which was predicted to be up to 20 feet in some areas of southwest Louisiana. "Just because the center is onshore, people shouldn't think that that water's not still rising," Mayfield said. "It is, especially on the east side of the eye." Hurricane Rita is leaving behind some scary numbers as it now moves inland over Louisiana and Texas this morning. -- A wind gust of 112 miles an hour at Calcasieu Pass, Louisiana recorded between midnight and one a.m.
-- Another gust of 116 miles an hour at a tower in Port Arthur, Texas, with sustained winds of 91 miles and hour. -- A rainfall total of eight inches at Lake Charles, Louisiana more than two hours before Rita made landfall. -- A coastal storm surge flooding of 15 feet above normal tide levels and up to 20 feet at the mouths of bays and rivers. SABINE PASS, Texas (CNN) -- With howling winds and driving rain, Hurricane Rita made landfall early Saturday along the Gulf Coast, just east of Sabine Pass, Texas. The center of the storm's eye crossed the coast at 3:30 a.m. EDT, forecasters said. For hours before landfall, the Category 3 storm -- packing winds of 120 mph -- lashed the Texas and Louisiana coasts. As it churned toward shore Friday, its storm surge caused renewed flooding in Katrina-soaked New Orleans. "Just because the center is onshore, people shouldn't think that that water's not still rising," said Max Mayfield, director of the National Hurricane Center. "Is is, especially on the east side of the eye." The water will not subside until Rita's winds die down, which is not expected before Saturday afternoon, he said. "We almost always have loss of life well after landfall," Mayfield said. Rita weakened in intensity from its peak Category 5 status, when the massive storm had maximum sustained winds of 165 mph as it moved through the Gulf of Mexico. But forecasters and officials warned residents to take the storm seriously. Power outages were widespread in the Texas and Louisiana regions subjected to Rita's wrath. Large trees were overturned in Lake Charles, Louisiana. By the time Rita made landfall, Lake Charles had received more than 8 inches of rain, according to radar estimates. "We've got a lot of damage," said Sgt. Joey Fontenot of the sheriff's office in Calcasieu Parish, which includes Lake Charles. "We're unable to get out of our building." In Lumberton, Texas, police had to rescue a family that was trapped in their home when a large tree fell on it. No injuries were reported. At 5 a.m. 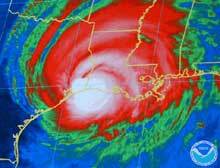 ET, the center of Hurricane Rita was located near Port Arthur, Texas, the National Hurricane Center said. Earlier, Port Arthur Mayor Oscar Ortiz had said was concerned about Rita moving across Sabine Pass, pushing a large surge of water toward the city. "If that's true, it will be under water," Ortiz said. "I hate to see what my city's getting right now."